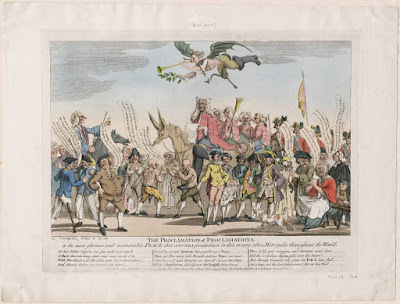 The Proclamation of Proclamations or the most glorious and memorable Peace that ever was proclaimed in this or any other Metropolis throughout the World, Jeffereys Harnett O'Neall, 1763, Lewis Walpole Library. 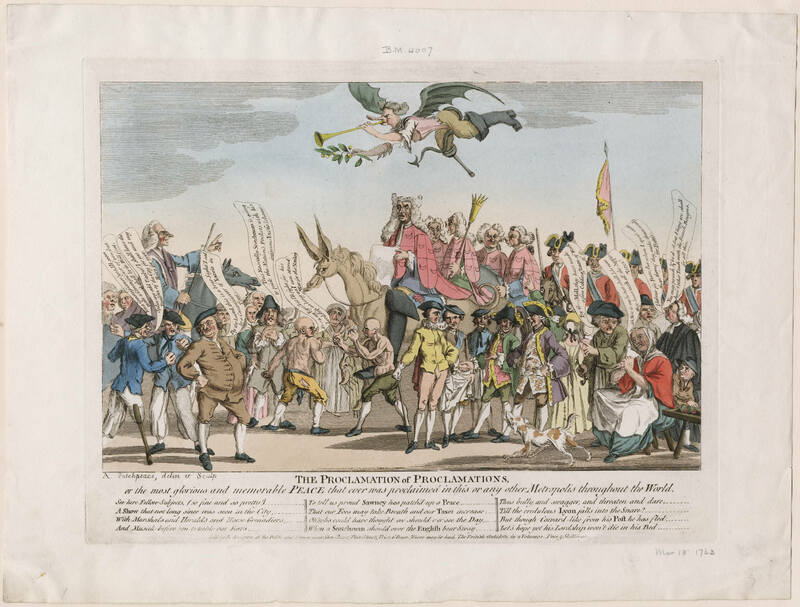 The Proclamation of Proclamations or the most glorious and memorable Peace that ever was proclaimed in this or any other Metropolis throughout the World, Jeffereys Harnett O'Neall, 1763, British Museum. So here Fellow-Subjects, (so fine and so pretty!) 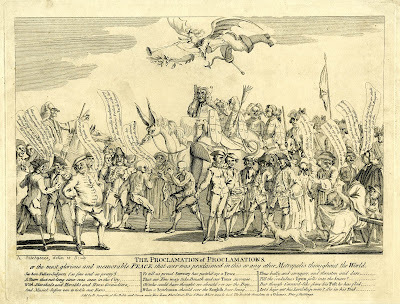 A Show that not long since was seen in the City, With Marshals and Heralds and Horse-Grenadiers, And Musick before 'em to tickle our Ears, To tell us proud Sawney has patch'd up a Peace, That our Foes may take breath and out Taxes increase, Oh! who could have thought we should ever see the Day, When a Scotchman should over the English hold sway, Thus bully and swagger, and threaten and dare, Till the credulous Lyon falls into the snare? But though Coward-like form his Post he has fled, Let's hope yet his Lordship won't die in his Bed. "Sawney" is a now obsolete epithet against the Scottish, and in this case refers to Lord Bute. Bute was the first Prime Minister from Scotland since the 1707 Act of Union combined England and Scotland into a single government. 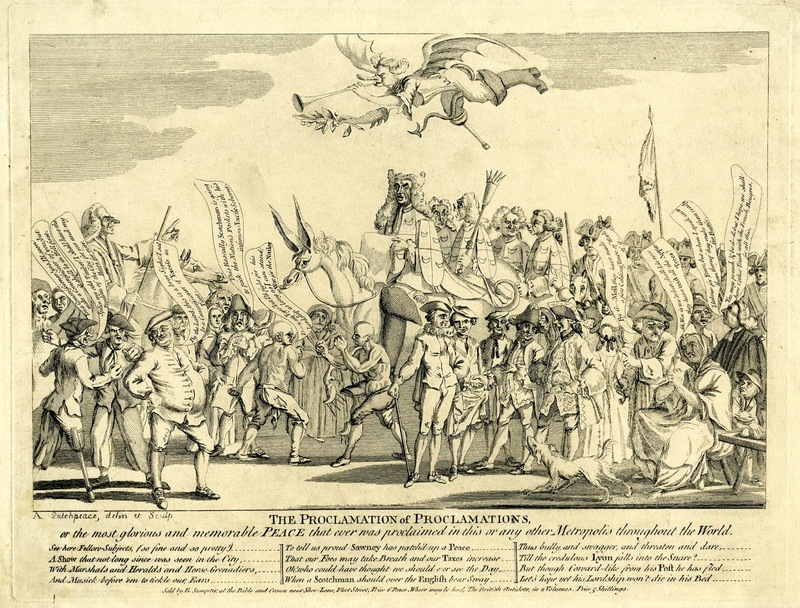 The Treaty of Paris was wildly unpopular among the English public and contributed greatly to Bute's eventual downfall, but that is another story. Among the many crowded figures in this piece, we can see a pair of sailors on the far left in the foreground. 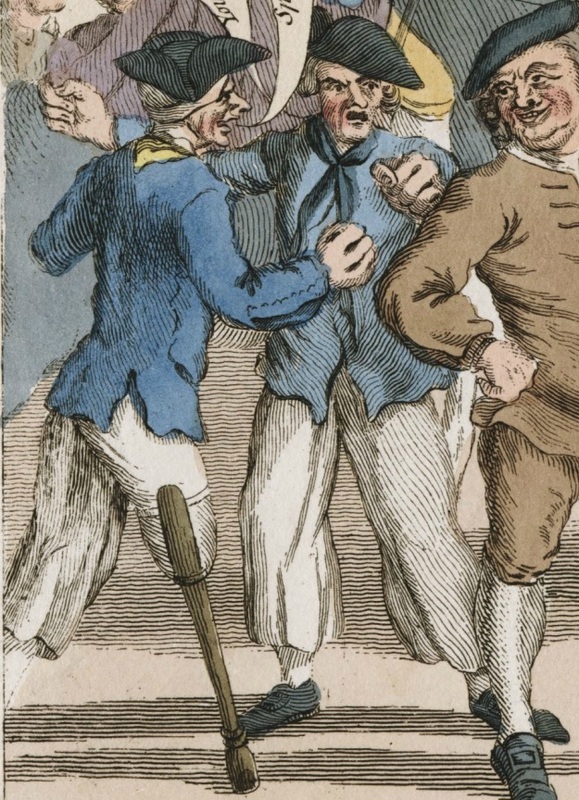 The tarpawlin on the right raises his fist to strike a Scotsman, saying, "You a Commisioner! yes, I'll soon make a Commisioner of you; but it shall be in Hell first." This angry jack is joined by his mate, looking rather worse for wear, who declares "Splice my old Timber! I shall have the Freedom of the City for me and my Heirs for ever." Both figures wear blue short jackets and cocked hats. Their jackets are slightly off in color, with the fellow on the left in a darker shade. His jacket has a mariner's cuff with an odd pattern to it, something like scalloping, but on the sewn edge. It could be that these are meant to represent buttons, but they are very numerous and closely spaced for that. At the rear, the wooden legged tarpawlin shows a triple vent ot his jacket. His mate's jacket is single breasted. One wears a black neckcloth, the other yellow. The tar on the right wears his hat backward over bob style hair with the curls off center, and loose fitting long legged trousers. Our wooden legged mariner wears the point of his hat forward, with petticoat trousers/slops hanging down from his one good leg. Both sailors wear white stockings, and the fellow on the right has pointed toe shoes with rectangular buckles.